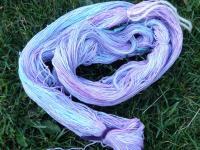 I finally got a day to dye some threads. Each hank was a full ball of Aunt Lydia's bamboo. Of course, I had to promise DS and DD a "tie-dye" party someday (when I'll either not dye anything, or wait till they are done ) so that I can help them. 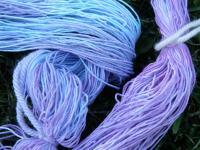 The Blue and Lavender one, and the Twilight Rose colored one, I used spray bottles to spritz the color on. 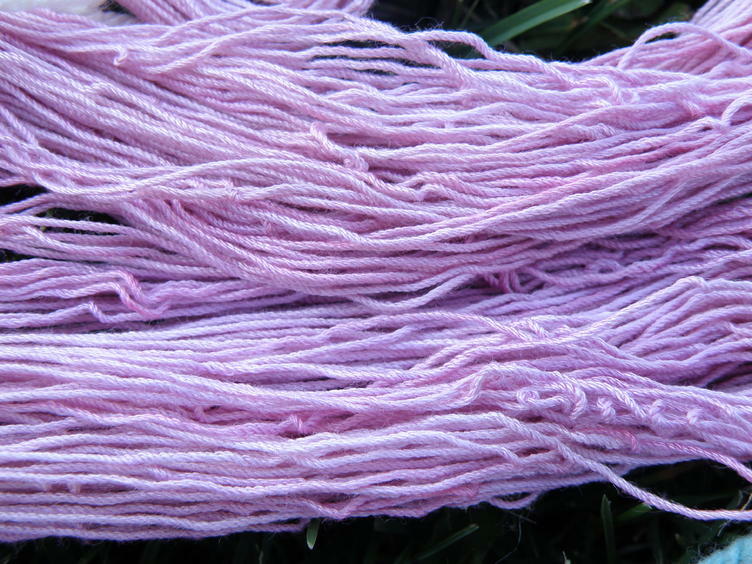 The darker pink one, I attempted a dip-dye, shading effect. It didn't work as well as I hoped, but there is some shading, albeit very subtle. I played at mixing all sorts of colors for this one. Thank you, tonyal. It's fun and addictive. 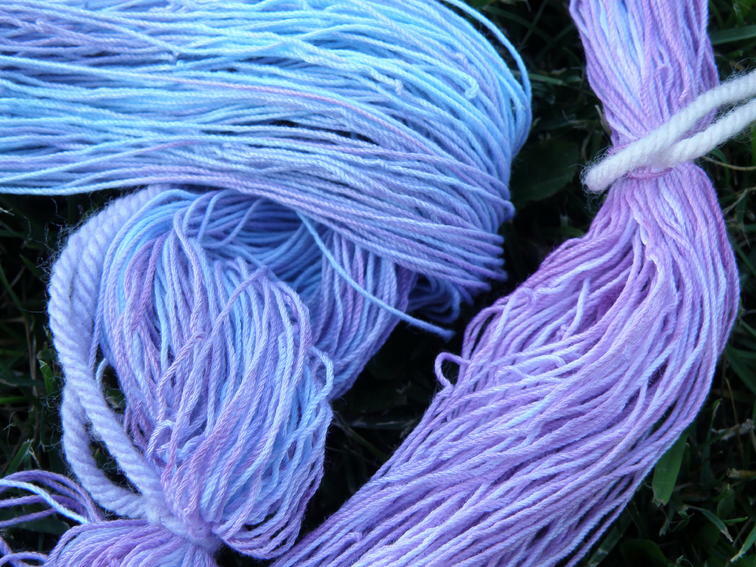 I use cotton yarns/threads (and bamboo) with fabric dye (like the tie dye kits...but I prefer dylon brand)...there's lots on here from others who've dyed wool with kool-aid, too. I'm allergic to wool, so I won't be trying that I'm afraid. Dye-ing is a lot of fun, I think. It's kind of a jump-in-and-try-it thing. I tried to dye wool once, using a crock pot and food coloring. It worked okay, but I would love to try your spray bottle technique. oh your blue and lavender one is sooooooo beautiful!! great job! These are lovely! I can't tell which is my favorite but I do know I always like subtle color variations — they can add so much richness and depth to a finished product. So what do you plan to crochet with them, Mom? I have no idea what I'm going to make with them, yet, Carla. But they're so much fun to make! and being thread.... ...maybe bookmarks, maybe more teddy bears, maybe something else. 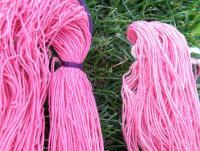 I may try a smaller (300yards or less) doily with the darker pink one. "spray painting" threads is so much fun! Melissa, I've never tried wool..I know you're supposed to be able to dye it with kool aid, and food coloring (hey, it stains clothing!) but I wouldn't know how. I'm allergic. I've never tried thread, either. 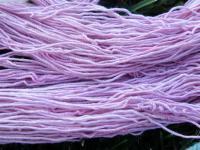 I get my yarn from goodwill/ sal val and yard sales, and sometimes there is a skein of wool or some thread mixed in. It took a long time, since I am not patient, and it had to soak in warm vinegar forever. 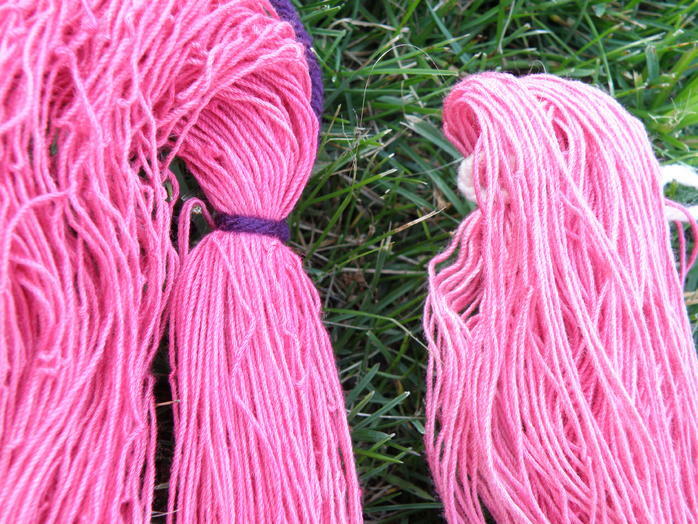 I haven't used it yet, but I want to try felting, and I have a small amount of thin wool stockpiled from my yarn grab bags over the last year. I made it a lemon/lime color. And used up all my food coloring.